Meow, so welcome to another blog post. Today's blog post is going to be a review thanks to the wonderful guys at The Blackhouse/The Grill On The Square. They invited me to try out their menu so I thought I would tell you about the restaurant, food and other things. WARNING: All of these photos are my own. Please ask permission before using them anywhere else except this website. They're not great so you probably wont want to but this is just in case and I hope that you don't mind me making this warning, They took a lot of time and effort, Thanks. The Blackhouse are a restaurant within Leeds City Centre who are also known as The Grill On The Square due to their location and the fact that they do quite a lot of grilling... Their main selling point is their steaks which are always served perfectly but they are. This includes the famous Wagu Beef which is massaged daily and fed beer and other things from my recollection. They also do wonderful seafood such as Calamari, Sea Bass & Lobster. We made our way out of Trinity and walked along to where we thought and then used Apple Maps to try and show us where to go... Apple Maps also likes to turn the whole map a different way as soon as you turn a corner which slowly led us into going the complete opposite direction of the restaurant until I realised and went in the right direction and within 5-10 of hesitation and attempts of trusting Apple Maps we finally ended up where we were meant to be. We finally entered the establishment and was greeted by a lovely woman. We told her that we had a reservation which we were fashionably late for (20-30 minutes is fashionably late if you can work it and not look like you've ran all the way there, right?) We were escorted to a table which overlooked the outside eating area as it was in a quiet corner but behind my seat laid a fan which was the best thing ever due to the excessive warm weather. We talked to the manager Chris who talked us through the many different beer options and how I think they change every so often. He also told us about Lobster Festival which is happening at this very moment. The Lobster Festival is where you can enjoy a full lobster and home cut chips (with either af thermidor sauce or garlic butter) all for £22.50 which is pretty amazing for lobster! If you're graduating this year then The Blackhouse have an offer on where if 4 or more guests dine then you get a free bottle of Champagne which I don't think its bad. It starts your night off with a bang and let's you celebrate in style! You do have to book a reservation and there is some T&C's to agree to when you book but if this sounds like you then I shall leave the link at the bottom of the post for you. We first ordered a cocktail. We both ordered a Spiced Passion Fruit Mojito. This cocktail contained Sailor Jerry Rum, Santa Theresa Rhum Orange (Rum Orange Liqueur) Passion fruit syrup. pineapple juice and lots of other delicious things. It was so refreshing especially in the warm weather which was a surprise for me and Leeds. The alcohol gave a slight strong kick to the drink where as the passion fruit syrup and pineapple juice made the whole drink slightly sweet which made you want more. Sprigs of mint remind me of Summer weirdly so this drink made me feel like I was in a forever lasting summer holiday. I could drink a thousand of them to be honest. We ordered Spiced Glazed Chicken Skewers with chipotle mayonnaise for our starter. Now personally, I felt like I should have ordered something as well but I felt bad if we couldn't share and there wasn't much on there that we both like due to Luke hating cheese and sea food and my hatred for walnuts if I can detect them. I felt bad if we couldn't share as we were in a more lets share some food and chat/use our phones sort of mood. The chicken was moist and succulent which is a pleasant surprise from the normal dry chicken that has became a norm all throughout the UK. The chipotle mayonnaise had some heat but not too much which meant I had a reason to keep dipping, It would be really good as a dressing for a crisp salad. There were also some crumbs which I think were blitzed up crispy onions but I wasn't sure but I loved them due to the texture they gave the dish as a whole. We then ordered our main courses which sounded a bit different at a steakhouse. Luke ordered a Pulled Pork Sandwich which came with a portion of home cut chips which were served in a little frying basket with some onion rings whereas I ordered a full rack of BBQ Pork Ribs with home cut chips and coleslaw. Luke said that the pork was succulent, tender and moist. He said that the chips were perfect. The ribs were so moist it was unbelievable. The meat melted in the mouth and the whole rack of ribs were doused in BBQ sauce. The sauce was smoky but sweet at the same time. The ribs were that nice I couldn't finish it which is a first as I can normally finish any ribs therefore it was that gorgeous! The chips were crisp and fluffy on the inside which contrasted between the textures and the temperatures were contrasting between the meat, chips and coleslaw. The coleslaw was refreshing, sweet yet tangy as I could tell that there was something in the background which helped the taste of the coleslaw as I aren't a big fan of coleslaw. We also ordered another cocktail at this point. This cocktail's called Summer-Thyme. This cocktail contains Plums, Thyme, Gin and some other great things. The thyme gave it a sort of different dimension. The plum made it somewhat Summer inspired. You could slightly taste the Gin but the fig liqueur took centre stage within this. I liked it but I felt that the cocktail was more for the spring time and I felt like a slight more gin could be used which is just my preference. I also think that if Blueberries took centre stage in this cocktail or Mango then it could be amazing as it would be sweet yet slightly tart. We then chatted and used our phones for a bit of a while due to Instagramming and other things. We drinked a little bit more of our Summer-Thyme. We were then asked what we wanted for our desserts. We both chose a Raspberry Pavlova due to the weather as Luke was thinking about a Sticky Toffee Pudding but it was weather that was more related to Spain or somewhere near there not England. The only problem with the Pavlova was the seeds within the Raspberries. I may be being a bit picky but I just don't like Raspberry seeds. The pavlova was amazing as it was chewy yet marshmllowy. The cream complimented the meringue whereas the sauce and fruit contrasted due to the tartness of the fruit which could also be said about the colour due to the fruit being placed on a sweet sugary blank canvas. The dish did look like pure art. We were also offered a liquid dessert but Luke couldn't even finish the pavlova so there was no point for him but I got an Iced Coffee as I thought that the Tiramisu cocktail would be too much even though watching Nigella talk about them on her show whilst she creates a small tiramisu. Chris offered to make one for me which was amazingly sweet. The iced coffee hit the spot as it was sweet but wasn't too sweet and it wasn't too strong either which was great as me and strong coffee don't go well together. We wrapped up and talked to Chris for a few minutes and talked about what I do with the blog and other things. I had such a great time at The Blackhouse with its professional interior and summery alfresco dining outside, Chris was amazing. He satisfied every need and quiestion and made sure to look after me and Luke whilst we were at The Blackhouse. He even recommended some things such as the coffee and the Mojito, I urge you to go as soon as possible if you can. I give this restaurant a 9.9/10. Everywhere can do with some improvements and I feel like I have listed them throughout the post. I feel like some of the mistakes were on my preference but I would gladly come back and enjoy more delicious food and thirst quenching cocktails. I can not thank the guys at The Blackhouse/The Grill On The Square especially Sophie & Chris enough for inviting me along to try out their menu, I loved every second of it. You should go check them out via their website or going to try some of their food in Leeds! 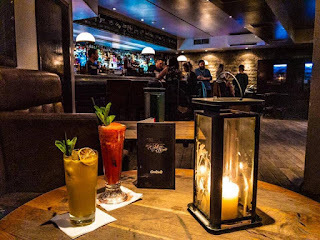 I shall be going back very soon and Luke has his eyes and mind set on getting more Spiced Passion Fruit Mojitos... A video of this shall be coming soon! I hope that you have enjoyed this blog post. I shall leave links down below but I shall see you next time for another blog post!